Generally, I’m not a fan of remakes and sequels as they are never as good as the original but Jumanji: Welcome To The Jungle is the rare exception. In 1995, Robin Williams starred in Jumanji, bringing us a funny, yet touching, film about a boy who gets trapped inside an old board game. Fast forward 22 years to 2017 and Jumanji was brought back to life, this time as an antiquated video game in Jumanji: Welcome to the Jungle. A group of four high schoolers, Spencer Gilpin (Alex Wolff; Patriots Day), Anthony "Fridge" Johnson (Ser'Darius Blain; Jane by Design), Bethany Walker (Madison Iseman; Still The King) and Martha Kaply (Morgan Turner; Invincible), all get thrown into detention together and are forced to do some chores while they are there. While cleaning up, they come across an old video game system. They all decide to play, each choosing a different avatar. Once Spencer hits the start button, the four are transported into the video game. Once they each arrive, they realize that they are all now trapped in their avatars' bodies, and learn that they must continue playing the game they started. As they travel throughout the game, the characters not only learn that you truly can't judge a book by its cover but that they all need each other in order to get out of this game alive. This film was a surprise for me, honestly. While I thought it looked funny in the trailer, you never know if you are just seeing the good parts in commercials and then the rest of the film falls flat in the theater. However, Jumanji: Welcome to the Jungle surpassed all of my expectations. It was really hilarious and the "avatar" cast, Dwayne Johnson (Rampage) as Dr. Smolder Bravestone, Jack Black (King Kong) as Professor Sheldon "Shelly" Oberon, Kevin Hart (Ride Along) as Franklin "Mouse" Finbar and Karen Gillan (Guardians of The Galaxy) as Ruby Roundhouse, were able to not only portray their avatar selves well, but they were able to also let the high schoolers' personalities trapped in their bodies shine through. Nick Jonas was also great in his role as Alex Vreeke, whose avatar was Jefferson "Seaplane" McDonough. There were nods to the original 1995 film as well, which was not only a nice touch but sweet tribute to Robert Williams. While Johnson and Hart were funny, Black as a somewhat shallow popular girl trapped in an overweight man's body stole the show. He stole all the scenes he was in and delivered some of the best lines in the movie. Gillan also has a few great moments including a nicely choreographed "dance fight". The 2160p high definition video quality really accentuates the jungle beautifully. The lush greens of the landscape pop off the screen. The Dolby Vision truly adds an extra layer of realism. The Dolby Atmos track featured alongside the 5.1 DTS track truly bumps up the viewing experience to the next level. All sounds that were garbled or muddled in the 5.1 DTS track are now clear and crips. All sounds of the jungle can be heard, even the wind whisking through the trees. 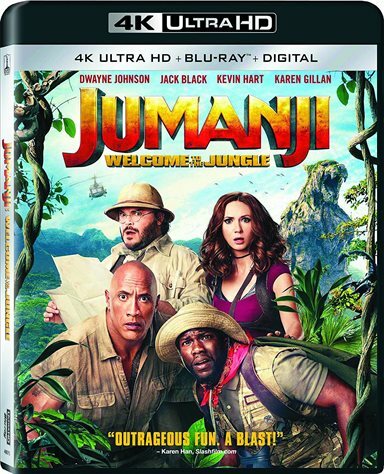 Download Jumanji: Welcome to the Jungle from the iTunes Store in Digial HD. For more information about Jumanji: Welcome to the Jungle visit the FlickDirect Movie Database.